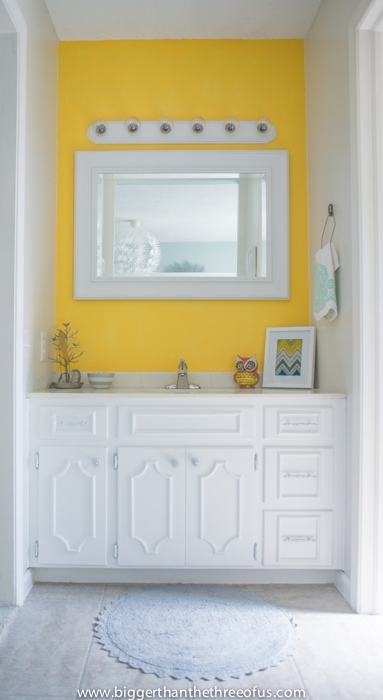 Thank you all for your lovely comments on our $87 Bathroom Refresh. Seriously, I’m overwhelmed by all the comments on the blog and social media. I so appreciate hearing from each and every one of you. It really makes my day when you guys reach out! 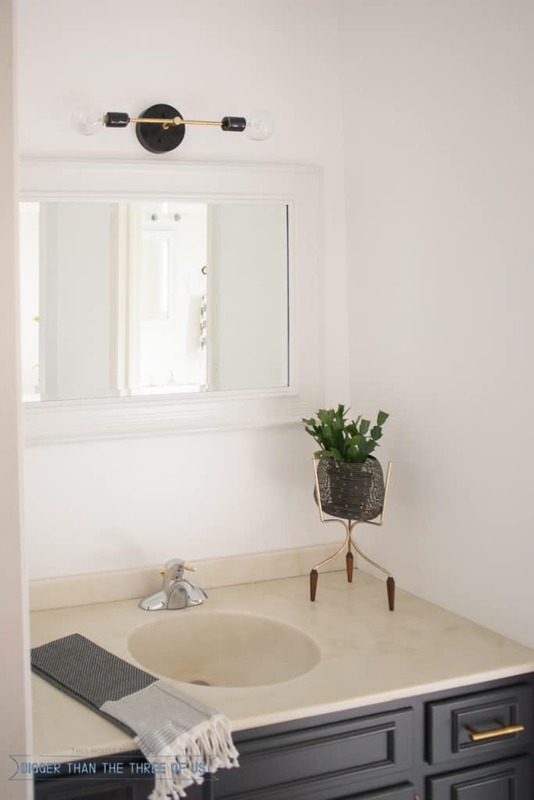 There’s been lots of chatter and questions about the bathroom light. 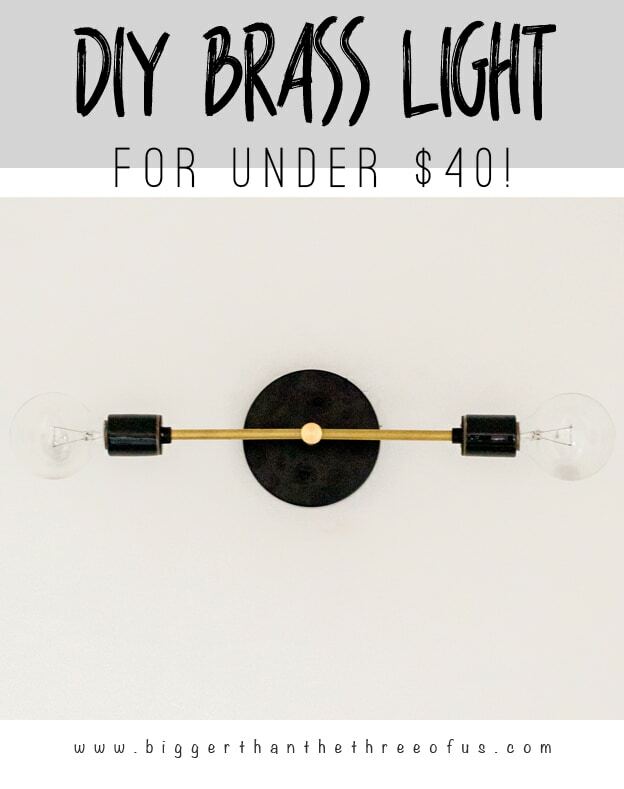 Today, let’s chat about that DIY Modern Brass Light that was so popular in the bathroom. *Edited on 03/07: Grand Brass created a DIY source list just for this light! You can DIY it for $20. It was the rockstar of the space if I do say so myself. So, first things first, electrical can be a scary thing if you don’t know what you are doing. As always, consult an electrician or a licensed professional for help with building this or installing it. If you are familiar with electrical wiring, this can be such an easy project. 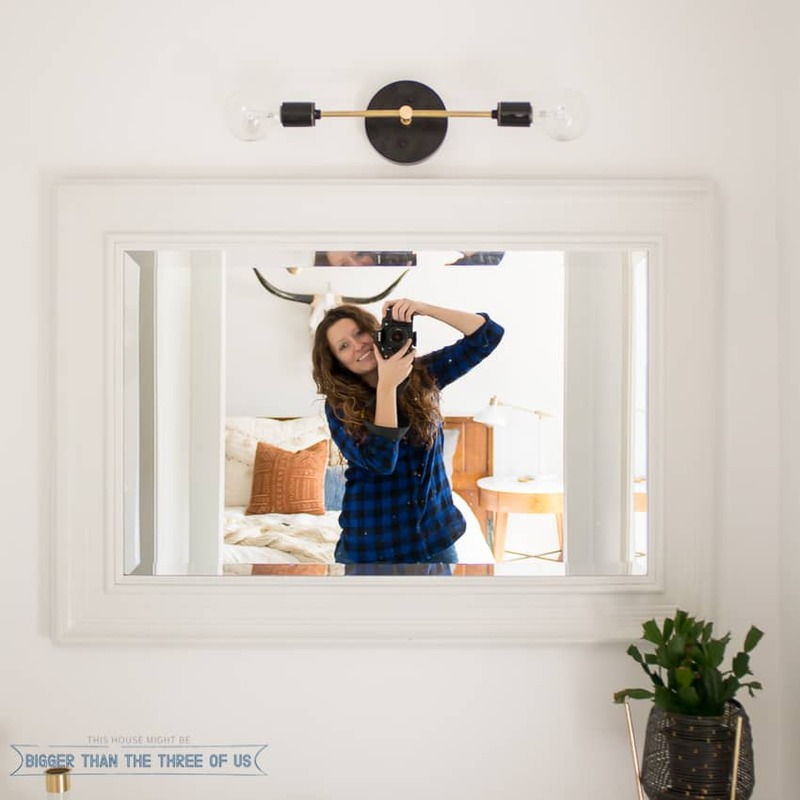 From start to finish, I believe this DIY Modern Brass Light took us 30 minutes. It took much longer than that to track down all the parts. Lucky for you, I’m giving you the part numbers. Minimal Modern Bathroom Nook Reveal for $87! So, I decided to tackle our Master Bathroom Nook. 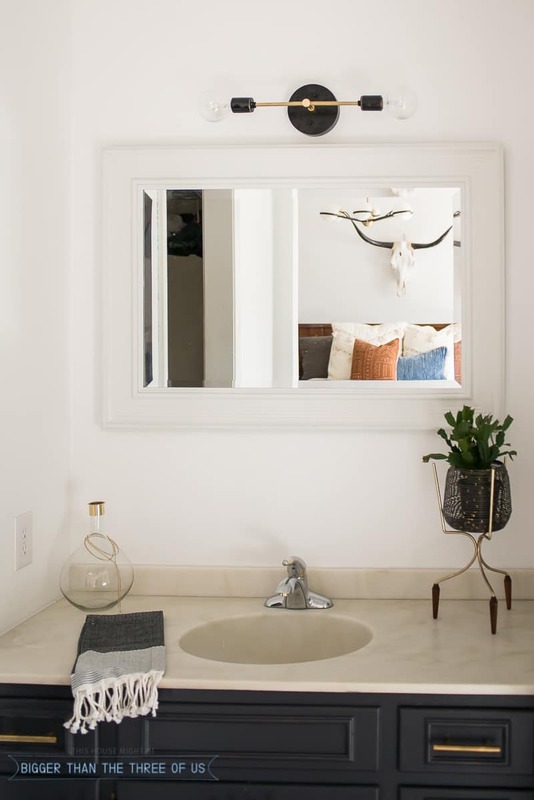 Are you ready to see the Minimal Modern Bathroom Nook Reveal? First, we have to take a quick look back. Although that picture doesn’t look bad, the painted cabinets were starting to chip and the yellow wall was dirty. It had all just seen better days and wasn’t at all going with the design of our master bedroom. 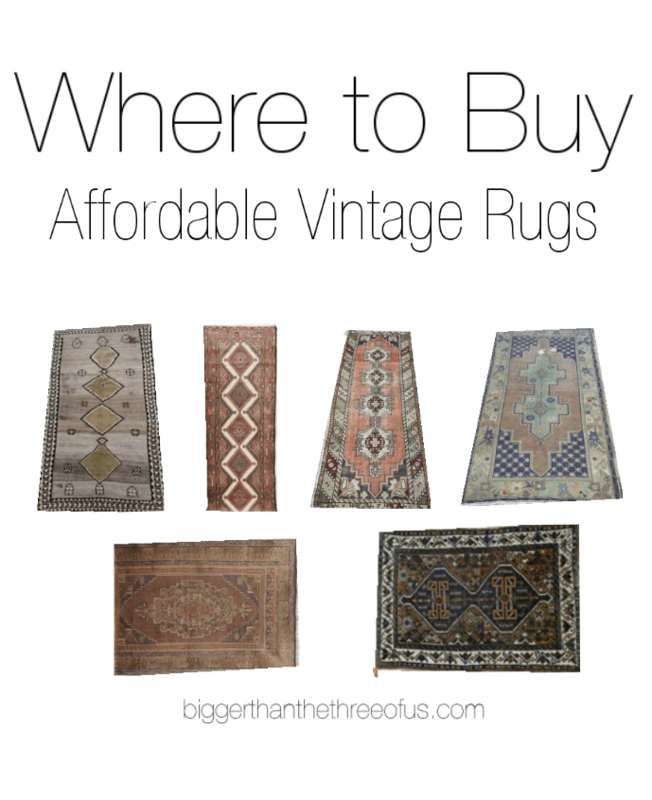 Now that I’m well-rested though, let’s chat about Where to Buy Affordable Vintage Rugs. I *may* have a rug buying problem. I’ll admit it. Although, I’m not buying rugs for spaces that we don’t need them for, I still may have a problem. I recently found one for the upstairs hallway and before I got it rolled out up there… I was curious to try it in the kitchen. I posted it on IG because I loved it in the kitchen and, low and behold, everyone else loved it as well. I’ve gotten so many comments about where I got this rug or that one and I’m here today to spill the beans. So, most of these rugs are vintage, which means that you probably aren’t going to find one that’s the exact same. But, this post is still valuable because I’m giving you my go-to sources (specific eBay/Etsy stores)!